With the release of Update 1.04, the 2nd part of the Red Bull X Challenge is now available. The full spec "Gran Turismo Red Bull X2014" racing car is introduced, and users can experience the unprecedented downforce generated by these ultra fast cars. 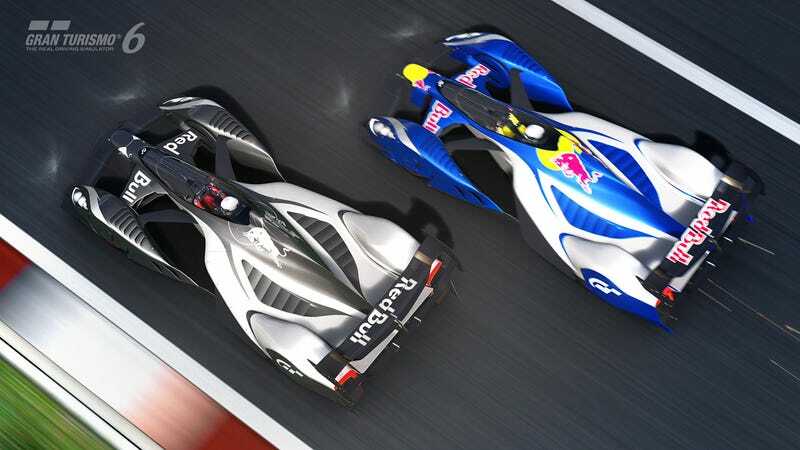 The two cars appearing in this part of the challenge are the "Gran Turismo Red Bull X2014 Standard" and the "Gran Turismo Red Bull X2014 Fan Car". At gran-turismo.com, we've produced a movie that shows the differences in the driving characteristics between the two cars. The "Gran Turismo Red Bull X2014 Standard" is a conventional aerodynamic Venturi car with a 2 litre V6 turbo engine producing 788 BHP. The car has the same characteristics of a modern day racing car in that its downforce rises as a square of its speed, while the corresponding produced drag (air resistance) obstructs its maximum speed. This also has the effect of changing the driving behaviour of the car according to its current speed. The "Gran Turismo Red Bull X2014 Fan Car" is the ultimate X2014 powered by a 3 litre V6 turbo producing 1,183 BHP. The air under the floor of the car is drawn out by the fan at the rear end, generating an extremely powerful downforce regardless of the vehicle's current speed. Since the car relies on this downforce for cornering, aerodynamics of the body can be more streamlined, reducing the downforce needed from Venturi effects. As a result, the drag forces are greatly reduced, raising the top speed of the car considerably, and offers a driving behaviour that is less affected by the current speed of the car. The difference in the way downforce is generated between a venturi car and a fan car is influenced by the difference in the speed variations when the downforce is applied on each of these cars. In the comparison image, the two cars are equal in high speed corners, but in chicanes and low speed corners the fan car is significantly faster. Experience the difference for yourself in the Red Bull X Challenge. The Corvette Stingray Gran Turismo Concept has been added to Gran Turismo 6. It is possible to obtain the car by participating in the new Seasonal Event, available only for a limited time. The "C7" 7th generation Corvette debuted in 2013, and is said to be the ultimate model in the history of the series. Gran Turismo has not only featured the final commercial model but has followed the development of the car from the very start, with even the test prototypes making an appearance in the game. And to symbolize the special relationship between the Corvette Development team and Gran Turismo, the Corvette Stingray Gran Turismo Concept was shown at the 2013 SEMA show. The concept model is a Corvette that balances track days and daily driving. While boasting high performance able to withstand tough conditions on the track, it can easily get to and from the circuit in comfort. The Corvette Stingray is already a car with an exceptional balance of overwhelming performance and refined ride comfort to begin with. Therefore in the Gran Turismo Concept, the engine and suspension were left stock, with a concentrated effort to further refine the exterior and interior. The body color was matched to the Blue image color of Gran Turismo 6, a matte finish that gives unique shadows and highlights to its surfaces. The engine hood with a specially made air outlet and removable roof have been made of carbon, with bigger 19 inch wheels in the front and 20 inch wheels in the rear for improved response. A carbon ground effect kit has been installed in the front and rear of the body for better flow of air under the floor, and a large carbon rear wing has been added that extends the body line and reduces air turbulence. The attention to the smallest detail is flawless. The L shaped outline of the headlights have been changed from clear to yellow, and the front grill, front fender outlets and rear quarter ventilation ducts have also been replaced with specially designed parts. On the interior, the dashboard and seats have been changed to a custom color, and a matching leather-wrapped roll bar has been added. Functionally speaking, designs more suited for driving on the track have been developed for the steering wheel and sport seats, and the car is also equipped with 4 point seatbelts for the harsh G's experienced when pushing the car to its very limits. Maintaining the allure of the original Corvette, factors required for sports driving are integrated throughout. This is the perfect Corvette Stingray that Gran Turismo fans have been waiting for. The Mercedes-Benz AMG Vision Gran Turismo Racing Series has been added to Gran Turismo 6. It is possible to obtain the car by participating in the new Seasonal Event, available only for a limited time. "Vision Gran Turismo" is a dream project in which leading international brands develop concept cars for Gran Turismo and its fans. And the car which kicked off the project with its stunning debut in November 2013, was the "Mercedes Benz AMG Vision Gran Turismo". The creation by the Mercedes-Benz design team is a sensual gull-winged sportscar designed in the image of a hunting feline. The car is elegance personified, infusing elements that show the 130-year legacy of Mercedes Benz perfectly with futuristic sports designs such as the LED front grille, an ultra light weight body and an exhaust system that is integrated with the tail lights. And for the "Mercedes-Benz AMG Vision Gran Turismo", there is also a separate version that is optimized for the competitive racing scene of Gran Turismo. This is the "Mercedes-Benz AMG Vision Gran Turismo Racing Series". The immediately noticeable difference with the original version is the fixed rear wing. Despite the increase in drag this creates, the aerodynamic device was utilized in favor of more downforce on high speed circuits. The side mirrors using CCD cameras were returned to conventional mirrors, and the rear brake light is decorated with the "Gran Turismo" logo for a touch of racing flavor. And of course the non-visible elements have also been stepped up. The AMG 5.5 liter V8 Twin Turbo has been raised to 591 HP, and the 7 speed dual clutch transmission has been optimized for transmission performance rather than ride comfort; now changed to a sequential transmission with dog links. Though the original is already extremely light at 1,385 kg, equipment for utility and comfort have been omitted to reduce the weight down to 1,300 kg. Lowering the ride height even further, the center of gravity has also been lowered for better circuit performance. The balance of ultimate elegance and competitive performance. This is another breed of the "Mercedes-Benz AMG Vision Gran Turismo", waiting to pounce on its prey. The 2nd half of the "Red Bull X Challenge" has been added to the Career Mode. In these new challenges, learn how to drive an authentic Formula car directly from the world champion, Sebastian Vettel. *Please note that the International B License is required to enter this challenge. With this update, the "Gran Turismo Red Bull X2014 Standard" and "Gran Turismo Red Bull X2014 Fan Car" have been added to the Dealership in-game. An alternative version of the "Mercedes-Benz AMG Vision Gran Turismo", released on December 2013 as the first Vision Gran Turismo car, is now available. It is possible to obtain the car by participating in the new Seasonal Event, available only for a limited time. The "Corvette Stingray Gran Turismo Concept", a car displayed at the 2013 SEMA show as a part of the collaboration between the Corvette development team and Gran Turismo, is now available in the Dealership in-game. It is also possible to obtain the car by participating in the new Seasonal Event, available only for a limited time. An in-game car from a year near your year of birth will be sent as a gift when you log in to PSN. The gift car will be distributed within 1 week from your birthday. *The information is taken from the player's SEN account used. A Remove Ghost Replay button has been added to the Arcade Mode Time Trial and Free Run Quick Menu. You can display this feature by scrolling the right of the menu. This will allow you to remove ghost data that includes unintentional shortcuts. It is now possible to see what prizes are awarded in the Seasonal Events. This information is displayed on the right side of the Seasonal Events entry screen.